Many prospective and current gun owners have run into problems bringing a new firearm into the house. Many have failed. Buying a new gun can pose financial and emotional difficulties if your spouse doesn’t share your interest in firearms. So how do you do it? You can get that new gun. 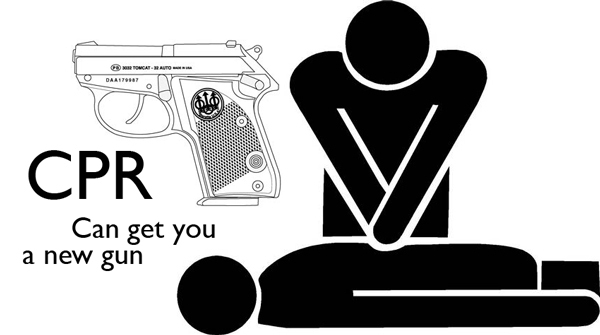 I call it CPR but it is not cardio pulmonary resuscitation. Let me explain. There are really only two ways to talk to your spouse about guns. You can be honest about it or deceptive. As an old married guy and pastor that has been in the gun community for a few decades, let me share. I believe in honesty. Honesty lasts longer, is less stressful, and is a win-win scenario for everyone. It is also the safest way. Undercover gun owners are often responsible for children or unwanted guests finding “hidden” firearms that “accidently” go off. Plus: buying a firearm together can be fun. Firearms can be expensive and the cost alone is usually the first item of contention with a couple. In a family, the cost of a new Beretta Cx4 Storm carbine, or even a used personal defense handgun can be equal to a large portion of family money. If you want to make it personal, a gun can be the cost of a new tablet computer, car tires, or a Christian Dior purse. Everybody has items they like that cost about the same thing. It’s all relative. Fear may be the underlying culprit of your opposition. If this is your first firearm, or your spouse is not a “gun person,” it will get tricky. Depending on the relationship you have, her opposition to the new gun could be a fear of the unknown, or a feeling that you may be endangering the family unit with this new gun. There is always a back-story. Sometimes the reaction is fear that has been generated by the media, someone she respects, past events, personal tragedy, or even a lack of knowledge. If the opposition stems from the loss of life of a family member or friend, you might be stuck for a while. It can still be resolved with time. Remember that. Poor timing can sometimes hinder your success. When you propose to buy this new firearm, your partner may feel it is not a good idea, or that a new gun will be a distraction. Listen for the reasons. Be patient. This may take more than a day, or a single conversation. It may take time for your spouse to sort through your past, the time, the money situation, and even trust issues. The good news in all of this is that you are already a winner. If you are married, that is evidence that your “significant other” is wiling to go along with you, and your desires. Respect your partner as a friend, lover and confidant. You have the key, but it is up to you to open the door. To open the door you have make your desire known. You have to communicate. Communication is the first “C” in my little acrostic. It is a two-way conversation. It is listening. It is discussion. It is waiting until points are made, and not yours. It is listening to the questions and the opposition, but not with the mindset that it is against an enemy. You are persuading a friend. Poor communication skills cause wars and civil unrest. Folks end up sleeping on the couch. Communication is not talking. It is a combination of talking and listening to be understood. It is an exchange. This will help you in far more ways that bringing a gun home, believe me. Over this time, address all the reasons you have to get that gun. Bring it in the home with love, sensitivity, and next part of my recommendation. The next part is “P” which is both patience and persistence. You can’t rush a cake that is baking, and you don’t rush this. Take your time and do it right. Pour on the charm and keep it on. Your spouse has married you and wants to please you. You might end up getting this firearm twelve months from now, but if you still get it, does it matter? Your spouse may even be the one that buys it for you, if you have shown the final part of the equation. Respect is the “R” in this acrostic. First, don’t make having to explain a task something you hate. Married people are sometimes nicer to strangers than we are to our spouses. Don’t take them for granted, even if you have been married for thirty years. Aretha Franklin got famous singing about “R-E-S-P-E-C-T.” A little kid with a rifle in Somalia, or a pistol in Baltimore will kill you for disrespect. It’s that important. Hopefully, you now have some more ammunition to use to successfully bring that new firearm into your home and you won't have to sleep with it out in the doghouse. It just takes a little C.P.R.